Few thinkers have been as influential upon current discussions and theoretical practices in the age of media archaeology, philosophy of technology, and digital humanities as the French thinker Gilbert Simondon. Simondon's prolific intellectual curiosity led his philosophical and scientific reflections to traverse a variety of areas of research, including philosophy, psychology, the beginnings of cybernetics, and the foundations of religion. For Simondon, the human/machine distinction is perhaps not a simple dichotomy. There is much we can learn from our technical objects, and while it has been said that humans have an alienating rapport with technical objects, Simondon takes up the task of a true thinker who sees the potential for humanity to uncover life-affirming modes of technical objects whereby we can discover potentiality for novel, healthful, and dis-alienating rapports with them. 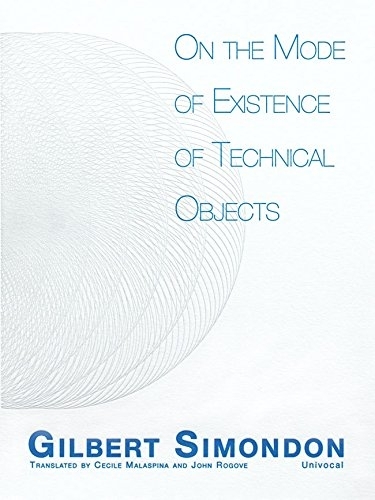 For Simondon, by way of studying its genesis, one must grant to the technical object the same ontological status as that of the aesthetic object or even a living being. His work thus opens up exciting new entry points into studying the human's rapport with its continually changing technical reality. This first complete English-language translation of Gilbert Simondon's groundbreaking and influential work finally presents to Anglophone readers one of the pinnacle works of France's most unique thinkers of technics.